As temperatures rise this summer, people turn to local beaches and lakes as a fun way to cool off. 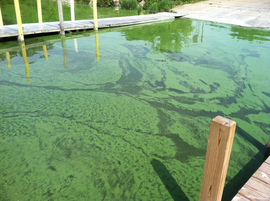 However, recent toxic algal blooms have hindered this experience for some in places likeFlorida, California, New York, and Vermont. Sea Grant and Lake Michigan. In this episode, Chris and Doggus head to the University of Wisconsin-Milwaukee’s School of Freshwater Sciences. Interesting things unfold outside, which call to mind unusual opportunities of employment for dogs, as well as some common sense things about feeding birds and owning dogs. Jane Harrison, an environmental social scientist working for Sea Grant, joins them for a walk and a chat about her work before Chris heads inside. via Sea Grant and Lake Michigan. In this episode, Chris and his dog stop at Harrington Beach State Park, on the shores of Lake Michigan. Listening to the gulls at the beach and seeing the warning signs about bacteria and beach closings, Chris recalls an informative conversation he had with Dr. Sandra McLellan and a graduate student from her lab, Amber Koskey. They reveal the science and challenges behind monitoring bacteria at beaches – the process that helps determine whether beaches are safe for swimming. Their work is vital for the health and safety of everyone who enjoys swimming in Lake Michigan waters.